Highest quality silicone wristbands. In-stock available to ship within 24 Hours! If a wristband is out of stock, delivery will be in two weeks. 100% silicone rubber. 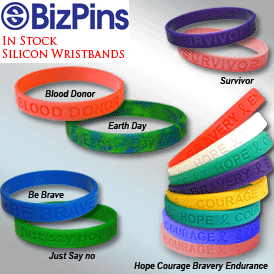 The Earth Day wrist band is made from recycled silicone. Standard Adult size is 8" circumference x 1/2" wide x 2mm thick. Standard Youth size is 7.5" circumference x 1/2" wide x 2mm thick. Pinnacle Prints Inc Once again, Barb and the BizPins team pull off a miracle! Perfect product AND on time delivery DESPITE quick turn and picky client!